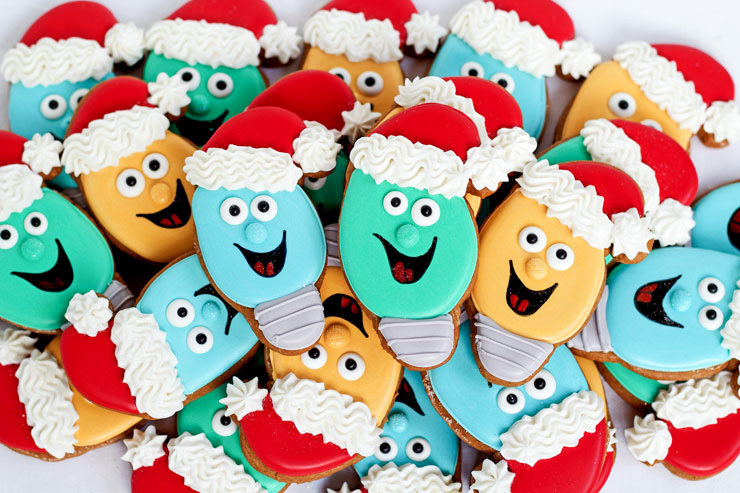 I am finding inspiration for my Christmas cookies everywhere this year. 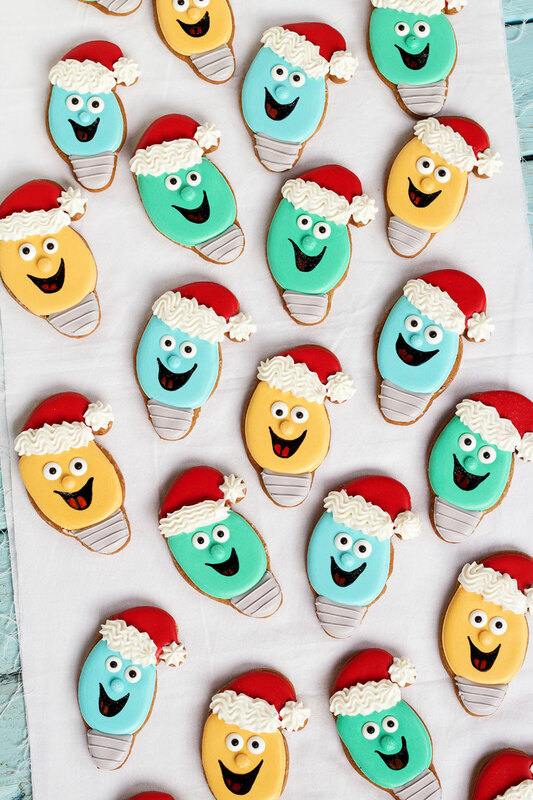 As I was trying to decide how to decorate these Christmas light cookies, I saw a vintage Christmas card on Pinterest and I knew what colors I was going to use to decorate these cute little light bulbs. A pale blue, minty green and gold are perfect vintage colors to go with the colors of that iconic Santa hat. They are so happy that they brighten my day! I hope they brighten yours as well. Now before you start asking, I did not hand cut these nor did I piece together cutters. This cute little cutter was made by a neighbor of mine. Well, I have never met her but, she is in a town that is pretty close to me. She found me online and the next thing I know, she sent me this adorable cutter. Isn’t it cute! If you want one, you can get it here. But before you go, let me show you how to make some light cookies. To Begin, outline and flood the bulb with the color of your choice While the icing is wet, add the candy eyes. Next, outline and flood the hat with the red icing. Let it dry for several hours or overnight. Outline and flood the base of the light cookie with gray icing. I want to take a second to share something with you. 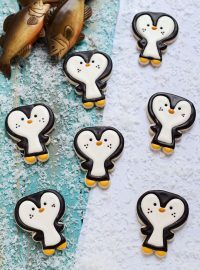 When I first started decorating cookies, I would lay the cookies on the table in front of me and move them as I finished each step. Then, I would grab the next cookie. Well, this took a lot of time and I somehow always managed to stick my finger in the icing. 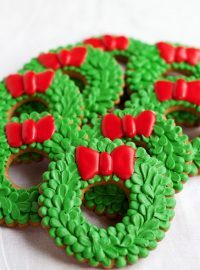 When I decorate now, I avoid that by placing the cookies on the edge of a large cookie sheet and rotate the sheet as I decorate. I don’t touch the cookies so I don’t make a mess. Just spin the baking sheet as you decorate. 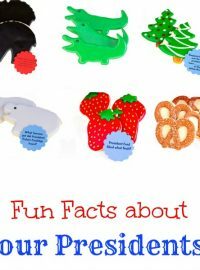 I just thought I would share that with you incase you have finger prints in your icing like I use to have. Once the gray icing on the base has dried for about 10 or 20 minutes, pipe three or four lines across to make it look like a real light bulb. I changed tips for this and used a PME 1.5 tip. The lines didn’t look as bulky. If you don’t have a 1.5 tip you can use a #1 decorating tip. Then, add the fur to the hat with the white icing and a #21 star tip. Just pipe a thick squiggle line across the brim and a dot on top of the hat. If you want, you can sprinkle them with a bit of Rainbow Disco Dust. Don’t worry if it falls on the hat or the face because light bulbs are supposed to sparkle. With a black food safe marker, draw a mouth and make a letter “m” shape for the tongue. Color the mouth black and the tongue red. I will admit, I colored the black part twice so it looked solid. See the blue mouth? It was only done once and well, I wanted a solid black mouth so doing it twice worked for me. 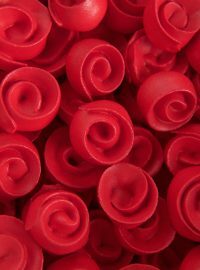 Another option is to use food gel and paint it. 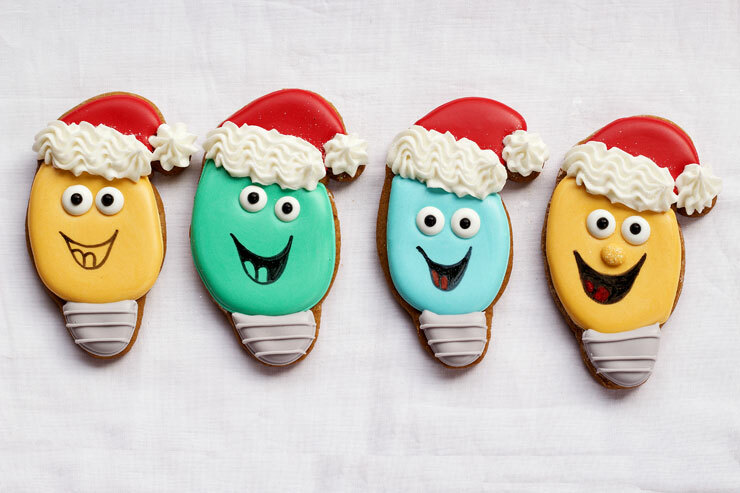 If you want more information on painting on a cookie, click here. Next, pipe a cute little nose and sprinkle it with disco dust. Shake off the excess, or use a dry paint brush to remove it or leave it for a bit of bling. I really like this cutter. 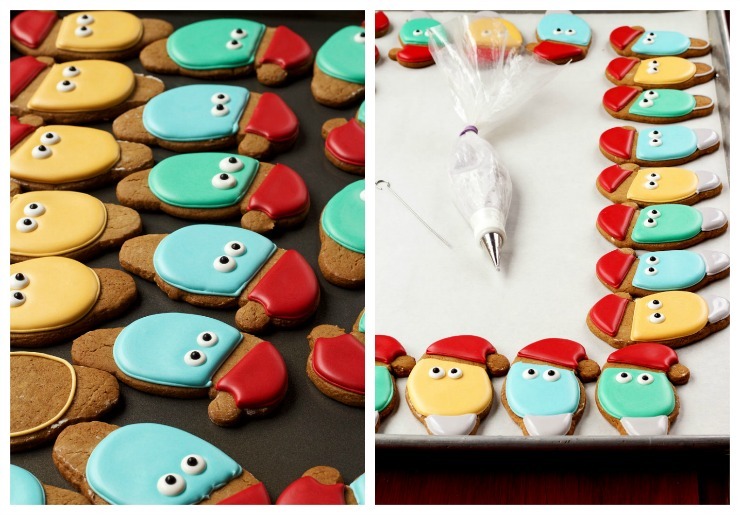 It was easy to follow the lines to get some cute and simple Christmas light cookies. Thanks, Shannon at Rolling Pin Prints Custom Cookie Cutters for sending it to me. Want more easy and “bright” ideas? These are over the top cute! Thanks Paula. That cutter makes it so EASY!! cutter… Can’t wait to make them! 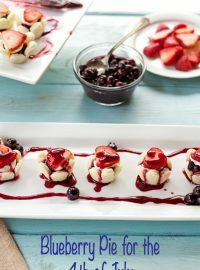 When you make them Yoli, I would love to see a picture! INCREDIBLY CUTE!! Thanks for sharing! You are very welcome Audrey! I am glad you like them! 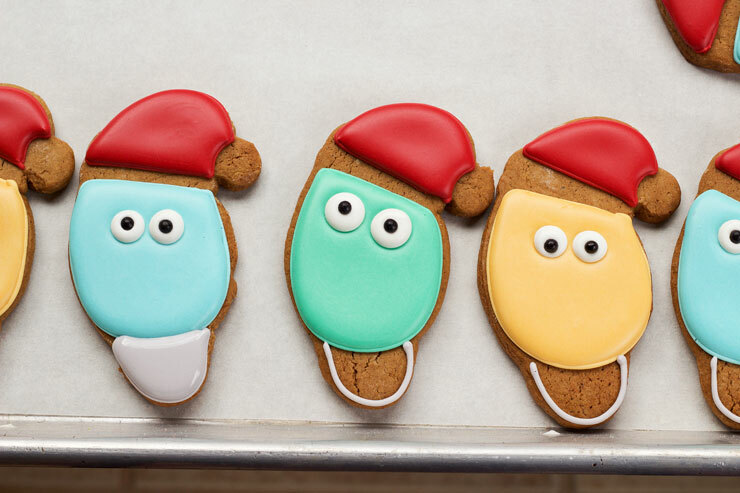 Oh Lisa, You always come up with the cutest little cookies. Love those vintage colors! Thanks Kim. I looked and I can’t find the card that inspired the color scheme but it was so pretty. These totally brightened my day. They are so amazingly cute. You have some of the most adorable ideas Lisa! Love these little bulbies!!!! 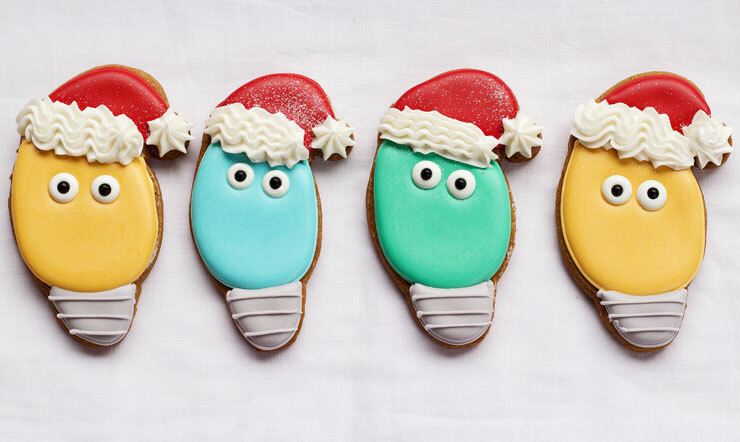 You are on a roll with the cute Christmas cookies! 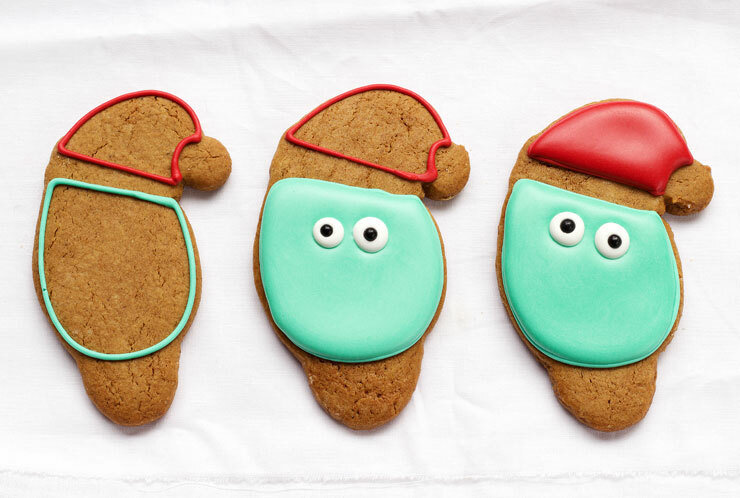 These are so darn cute! Also, Thanks for the tip; I just got a thumbprint (finger smudge, actually) on one of my cookies the other day…arrghh! Ugh! I can’t get to this website! It comes up and says it is an insecure website. Anyone else have this issue?